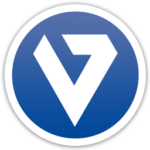 Microsoft Visio® files of .vsd, .vdx and .vsdx extensions are some of the most complicated for Mac users as there is no Visio® for Mac. In the past, opening Visio® documents was impossible since this file format is proprietary. Visio® drawings had to be converted to a more modern, but less common XML format, for which it was easier to find a Mac program viewer. In this article, we will take a look at 7 Visio® readers and explore their features. LucidChart is an online diagram tool which enables users to collaborate on Visio® documents. LucidChart allows team members to preview and edit Visio® files, create graphic files and export them to VDX. It has some great features, such as an opportunity to comment, view a revision history and use embedded docs. 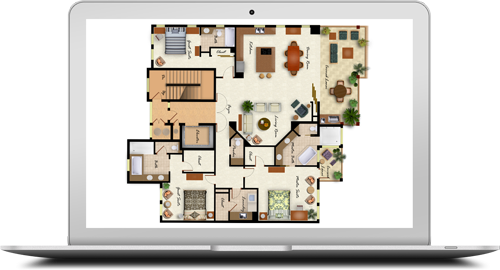 It works on any browser and has Chrome and Firefox plugins, which let you automatically open Visio® files shared via the Internet. Since the program allows collaboration within small teams, the document can be conveniently edited by team members without having to send flowcharts back and forth. 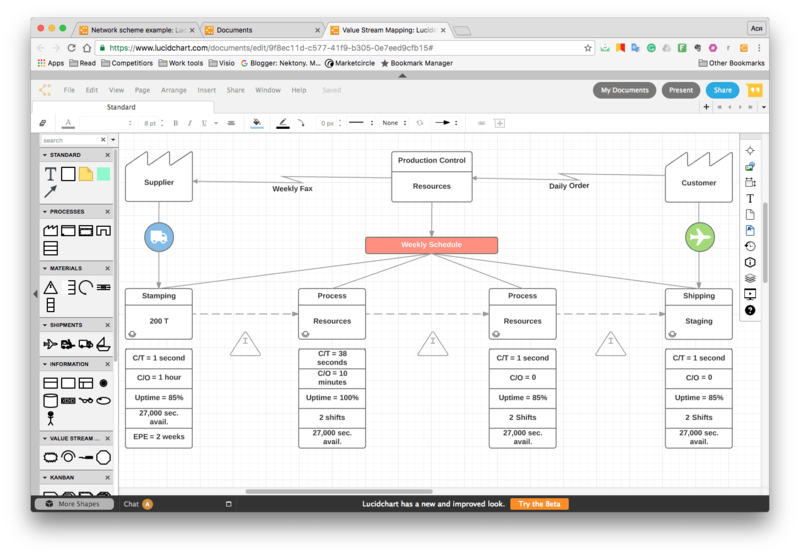 LucidChart is a complete professional Visio® alternative for any non-Windows platform. However, it has a couple of drawbacks. Firstly, .VSD and .VSDX extensions are not supported. It can only import .VDX format. Secondly, it can open only Visio® files which are stored on the web. This could be a bother as you cannot open files directly from your Mac and would need to upload big files to a cloud. It is also logical to assume that any online program cannot provide the high level of security you may need for your company documents. 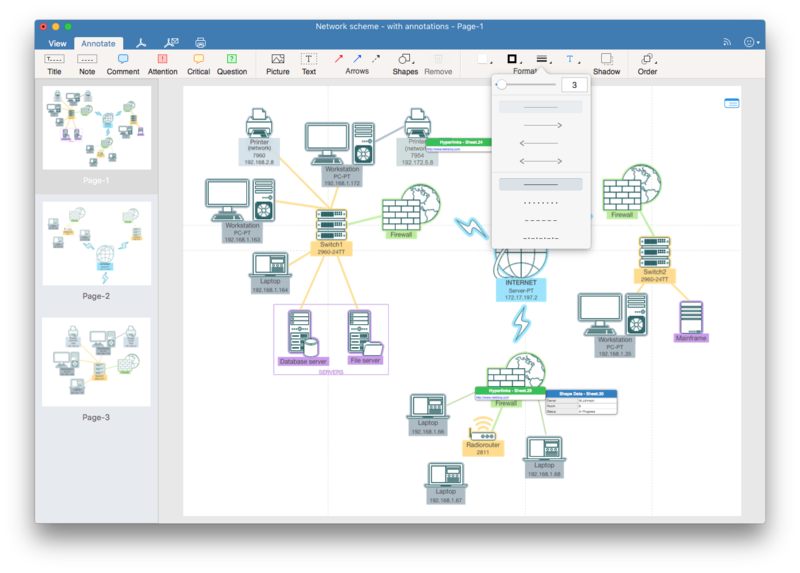 SmartDraw is a good Visio® equivalent for Mac users because it supports thousands of templates and allows you to create over 70 different types of diagrams. SmartDraw allows you to open and edit both .VSD and .VSDX Visio® files on a Mac. You can edit pages, ungroup symbols, change colors and alter the sizes of shapes. With SmartDraw Cloud you can do your editing right in a browser and send the link to your colleagues. The main pros of SmartDraw are: viewing and editing Visio® files; an online version that allows you to open files on any device; cloud integration; and thousands of templates and shapes to choose from. The downside is that SmartDraw doesn’t export files to Visio® extensions. You can, however, export files in a Microsoft Office format, PDF, PNG, SVG. Omnigraffle is another application for creating graphics with a friendly interface. It provides a wide variety of stencils and has many great features. ThePro version supports the import of files, templates and stencils in .vsd, .vsdx, .vdx, .vst, .vtx, .vss and .vsx formats as well as their export to a .vdx extension. Omnigraffle is designed especially for the OS X operating system, so Mac users would find it very convenient. All you need do to open Visio® flowcharts and diagrams is to drag them to an Omnigraffle icon in a Dock. These factors certainly make Omnigraffle Pro more powerful than Microsoft Visio® and a good replacement. However, we have had some complaints from users about its instability while editing Visio® drawings. They also claim that when displaying complex drawings the system has sometimes crashed. If you wish to use Omnigraffle, then we would strongly advise you to save your ongoing work frequently to guard against the crashing or freezing of files. ConceptDraw Pro provides a set of drawing tools and libraries of numerous templates and objects. 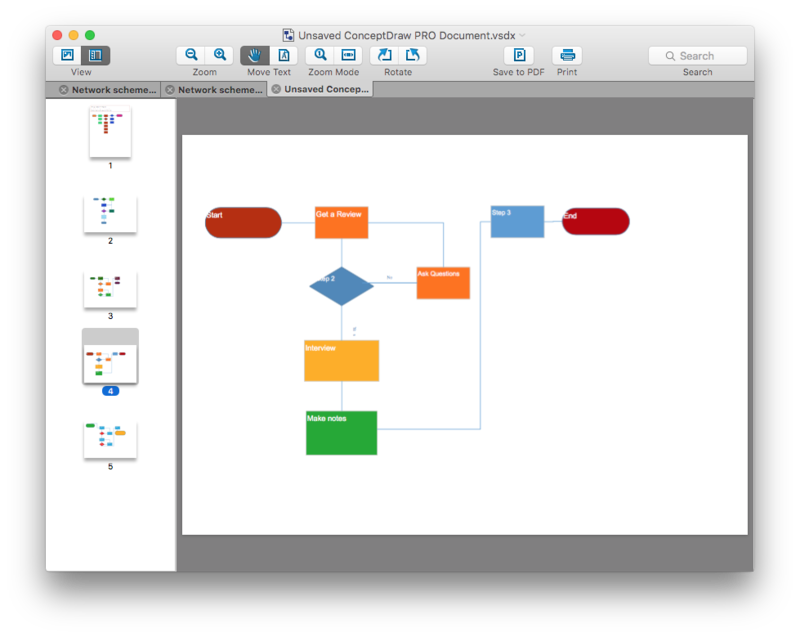 If you need to view Visio® documents on a Mac, ConceptDraw is very helpful. It allows you to open .vdx and .vsdx file formats and has several file export options. However, when opening .vsd docs the task is quite complex. You would need to convert .vsd to .vdx via an online converter or send the file to ConcepDraw team via email to get back a converted format. 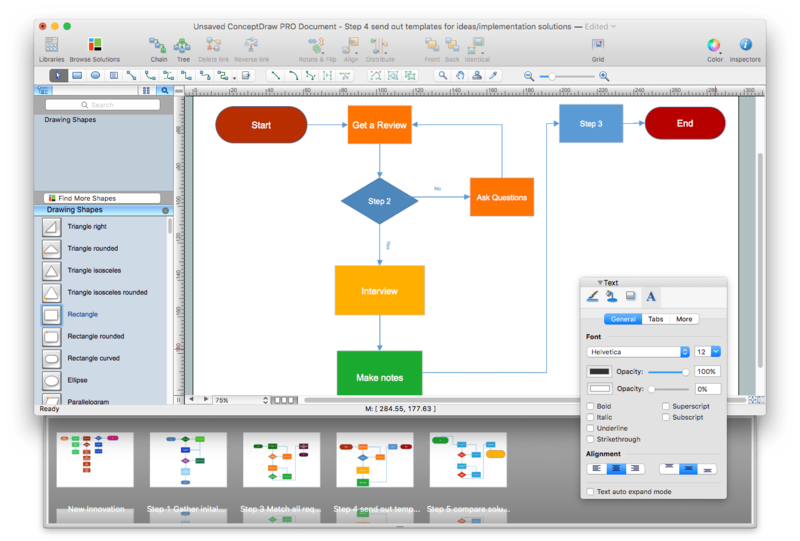 What you would like about ConceptDraw is the ease and speed of editing Visio® documents. In fact, you will find creating flowcharts, diagrams, mindmaps and other drawings with ConceptDraw most enjoyable, as there are thousands of templates. 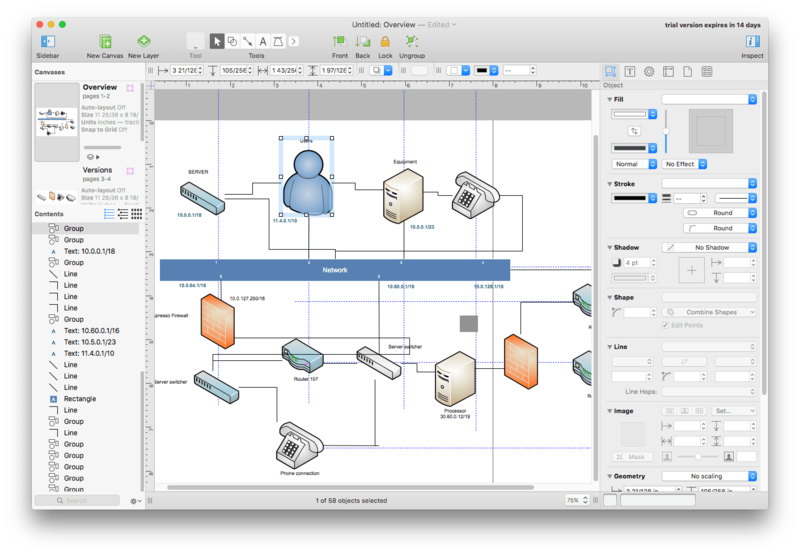 Designers in CAD environments prefer using ConceptDraw as a serious alternative to Visio® on a Mac. 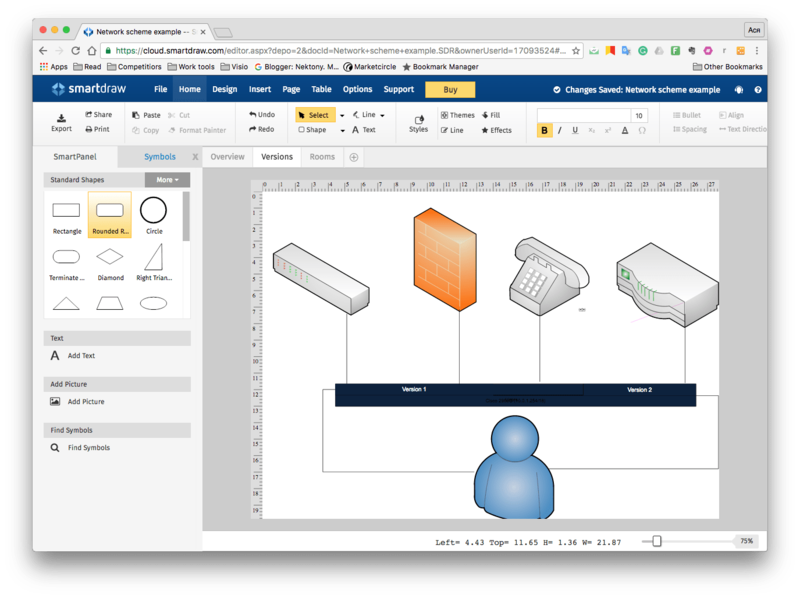 Most of the key features of MS Visio® – layers, shapes, connections, Snap To Grid and editing tools – are found in ConceptDraw. It also has a wide range of graphic elements, although some of them are only available for a fee. That increases the product’s cost. In short, ConceptDraw Pro is a powerful graphic app but has some drawbacks in that there is no free upgrade and it does not support the import of .vsd files. VSDX Annotator is an application created by Nektony to view, annotate and convert VSD, VSDX and VDX files on a Mac. VSDX Annotator is not a graphic app like Omnigraffle, ConceptDraw or SmartDraw. However, it is a great replacement for Visio® on a Mac when you just need to view drawings and make small notes and changes in the document. Designed to make collaborating on Visio® documents easier, it supports opening .vsd, .vdx and .vsdx files. What’s more, you can convert your drawings to PDF or even save .vsdx in the same file extension for further editing in Microsoft Visio®. VSDX Annotator provides 12 annotation tools, such as adding and editing text, shapes, lines and arrows and others. Inserting graphic files is also possible. What you would like about VSDX Annotator is its perfect rendering of Visio® drawings and ability to display even Metafiles and OLE-objects. VSD Viewer is one more tool by Nektony that can be considered a good replacement for Visio when you need just to view drawings on a Mac. VSD Viewer allows you to open .vsd, .vdx and .vsdx files on a Mac by simply dragging the files to the app’s icon or window or double-clicking on the relevant Visio file. VSD Viewer supports the layering of images, shapes and guides. Unlike other common Visio viewer apps, VSD Viewer is a powerful Visio reader as it renders EMF / WMF metafiles, OLE-objects, objects outside page boundaries, and gradient-filled objects. There are also VSD Viewer versions for iOS and Android platforms. Finally, VSD Viewer ensures high security for your files since they are no longer stored online. Cisdem DocumentReader allows users to open many types of files including Visio® documents. This app provides several viewing features like searching pane, page navigation, zoom, rotate, save and copy. However, the software has its limitations in that only the simplest of Visio® documents can be clearly viewed. There may be distortions or damage for more complex renderings. I would therefore not recommend Cisdem DocumentReader for complex technical Visio® documents. In summary, there are some powerful graphic programs which allow you to open, edit and create files in Visio® file formats. 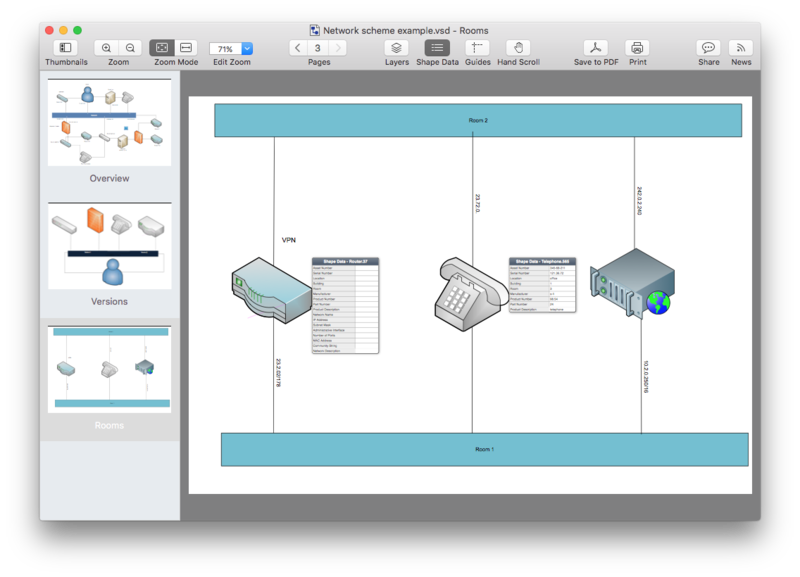 There are others that allow you just to view and modify Visio® files on a Mac. You can choose either desktop or online versions, either for drawing flowcharts or for previewing Visio® files based on your professional needs and budget. If you are still not sure which Visio® alternative best suits your specific needs, here is a short comparison chart that might help. Looking at the comparison chart of Visio® alternatives, I would conclude that Lucidchat is the best online Visio® editor. It is reasonably priced compared with Omnigraffle and Concept Draw Pro, and is very easy to use. On the other hand, if you only need to preview Visio® files on a Mac and just make a few notes and changes in the file, then I would recommend VSDX Annotator. Those who prefer a Visio® Viewer for several operating systems (Mac, iOS, Android) can choose VSD Viewer.